Of course Bolivia Doesn’t Want a President for Life! This article is accurate until the last paragraph as it doesn’t capture the real evo, he came from a very vertical union and as such he does as he pleases, he is like a Führer and nothing happens without his consent. Thus, he will relentlessly push for holding power, at all cost! He is nothing more than a despicable egocentric caudillo of the coca growers’ union, who want to expand their “business” … The above is the opinion of Bolivian Thoughts! Three terms is already more than enough for Evo Morales. Calling out a head of state at his own ceremony might seem like political folly. Not least when it’s Evo Morales, Bolivia’s willful three-term president who is now stumping for a fourth — public opinion and the constitution be damned. But if veteran Dakar Rally quad racer Leonardo Martinez had second thoughts when he recently gave Morales a piece of his mind after crossing the finish line in the Bolivian capital, he didn’t show it. “Mr. President, Mr. Vice President, the majority of us voted ‘No,’” Martinez stated on the podium before Morales and his entourage. “When I entered (the) Dakar (race) I submitted to all the rules. I’m not a politician, I only ask that you respect the constitution and February 21,” Martinez said, nodding to the date of a referendum last year in which 51 percent had voted against changing the constitution to abolish presidential term limits. Bolivians took note: The graying sportsman instantly became a national celebrity and his impromptu live-television slap to the national leader, a hit on social media. The incident also reflected a shift in this poor Andean nation of 11 million, where “caudillos” like Morales and their stagecraft no longer cut it with voters. Tens of thousands of protesters hit the streets across Bolivia on Feb. 21, the anniversary of the referendum. Recent opinion polls put Morales’s approval ratings at a record low of 22 percent. The mood is much the same across Latin America, where superheated calls for 21st-century socialism have given way to mass demonstrations, political strife, economic debacle and the region’s worst refugee crisis in memory. 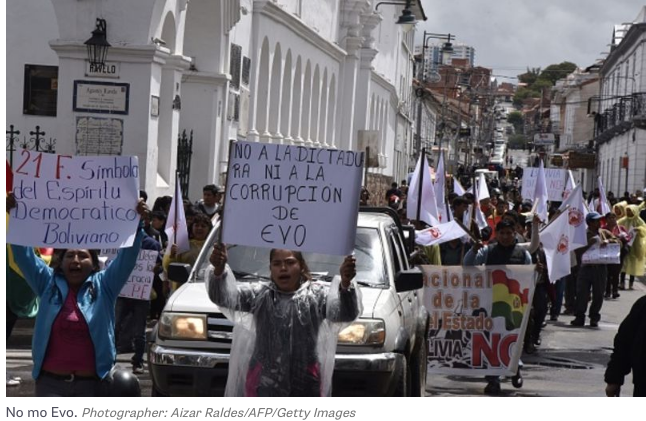 Even though Bolivia’s economy is in better shape than some of its like-minded peers’, the Morales government’s penchant for big spending and market meddling has dulled investor appetites and drawn fiscal red flags. Sadly, however, Bolivarian politics is not the Dakar Rally. Morales has persisted in his campaign to subvert the referendum he lost and to run again for a fourth term. His defense? Term limits violated his “human rights” by constraining his political choices and those of the Bolivians. Never mind that the American Convention on Human Rights he invoked was written to protect critics and political opponents from the fiat of overbearing autocrats, not the other way around. Unsurprisingly, the regime-friendly Constitutional Court agreed and overturned the referendum, arguing Morales had been the victim of a smear campaign — a claim that international observers found ludicrous. “Evo Morales is manipulating the rules of the game and turning his back on human rights to cling to power,” Human Rights Watch’s Americas director Jose Miguel Vivanco recently declared on Twitter. Bolivia’s former ambassador to Washington, Jaime Aparicio Otero, agreed. “The impression you get is that Morales will do anything to stay in power, and will win, no matter what,” Aparicio told me. Morales is not just gaming the rules to advance his re-election ambitions. He’s also tightening his grip on Bolivian democracy through dubious decrees and impulsive populist initiatives. Look no further than last year’s penal code “reform,” which targeted journalists for “defamation” (Bolivarian code for displeasing authority), imposed draconian penalties against physicians convicted of malpractice (a potential chilling effect for health care), and all but outlawed religious evangelism (a slap at organized religion). After weeks of protests, including a 47-day physicians’ strike, Morales was forced to revoke the reform in January, a costly defeat for a leader who’d risen on the promise to “re-found” the nation. Morales could still stand down at the end of his term in January 2020, cut his losses, and leave office with the laurels of the country’s first indigenous leader who presided over a decade of strong growth and an admirable spurt of social inclusion for Bolivia’s forgotten poor. Far better that than to join the ranks of leaders who have squandered their legacy by attempting to warp the law to their dynastic agenda.